So what will Dana White and the UFC do? 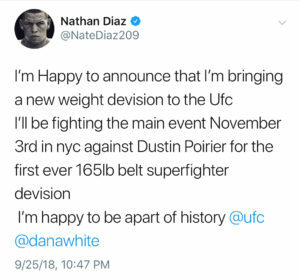 Like most people, I went to bed early on Tuesday and missed the big “announcement.” Nate Diaz claimed that he and Dustin Poirier would be fighting for the new 165-pound title on UFC 230. A win for the fans, right? We haven’t seen a Diaz in a title fight since the “IV incident” with big brother Nick and GSP. It’s also a big win for the small 170-pound fighters and the big 155ers, like Donald Cowboy Cerrone or Michael Chiesa. 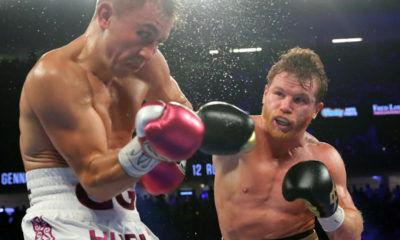 Many fighters from welterweight and lightweight have been clamoring for this new weight class for various reasons. Some of the best lightweights in the UFC have shown difficulty hitting the weight. A 165 division would be the perfect home for someone like Kevin Lee. Fight fans know how hard it is for him to make 155, but he wouldn’t be big enough for welterweight. But Dana White and the UFC shot that down. White says they are still looking for a main event for November 3rd. A fight that is up in the air is Yoel Romero and Alexander Gustafsson at light heavyweight for an interim belt, possibly undisputed belt, even though current light heavyweight and heavyweight champion Daniel Cormier defended his belt in January. 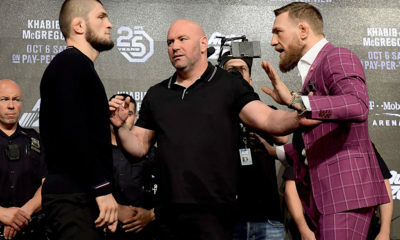 Also, this fight would be between two fighters that just had to pull out around UFC 230. Romero was scheduled to fight rising star Paulo Costa and Gustafsson was scheduled to fight rising light heavyweight Anthony Smith. Just a coincidence, I guess. Dana White also shot down the possibility of Jon Jones fighting at 230, but usually when Dana tells his little “White” lies, they become truth. So what can you believe? 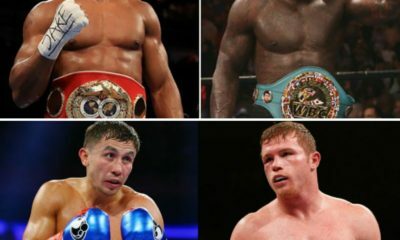 The best move for them is to establish the 165-pound title on November 3rd. It’s simple. The UFC has a good track record for making history in New York, good or bad. 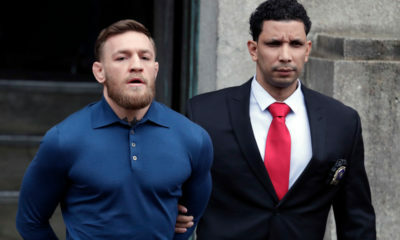 From UFC 205 to dolleygate, the UFC shows up to NYC. Also late last week, the Professional Fighters League made history by establishing the new women’s lightweight division. If you don’t think Dana wanted to do that or was at least thinking about it, you aren’t very familiar with Mr. White. The making of this division sets up amazing fights for the UFC down the line. Possibly Diaz v. McGregor 3 for the 165 title, McGregor v. Poirier 2 for the new strap, Diaz/Poirer v. Khabib. Maybe even a McGregor/Nate Diaz v. Georges St. Pierre down the line.